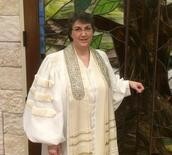 Rabbi Dr. Jana De Benedetti has been the Spiritual Leader and Rabbi at B'nai Zion Congregation since 2006. She has also been the Cantorial Soloist at B'nai Zion and has led services in many states and in Israel. At B’nai Zion Congregation Rabbi Jana teaches Jewish music, Hebrew, Jewish studies, and Torah studies. "Dr. J" has been teaching Hebrew and Jewish Studies for more than 40 years at synagogues, other public institutions, and as a private tutor. She has taught Hebrew at the State University of New York at Albany (SUNYA), Spertus College of Judaica in Chicago, Illinois, LSUS and Centenary College in Shreveport. While in Shreveport she was Educational Director at Agudath Achim Synagogue. and was the Hebrew instructor at the Christian Center Montessori School. She was head songleader for summer sessions at Greene Family Camp in Texas, Camp Eisner in Massachusetts, and Henry S. Jacobs Camp in Mississippi. She was songleader for retreats at those camps and also at Kutz Camp in New York, Camp Harlam in Pennsylvania, and Olin Sang Ruby Union Institute in Wisconsin. She has published scholarly texts and articles, and helped to produce record albums and songbooks of Jewish music. Doctor Jana has earned a B.A. in Judaic Studies, an M.A. in Philosophy, and a Doctor of Arts in Humanistic Studies with specialization in Linguistics from SUNYA. She was ordained a Rabbi at RSI. Rabbi Jana makes learning Hebrew and Judaism enjoyable and joyful. She is beloved in the interfaith community. Her services are warm and welcoming.